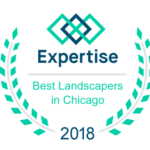 We are proud to be featured in Expertise’s list of Top Landscapers in Chicago. Every year Expertise runs an analysis on all selected businesses, to ensure they meet their standards of excellence for consumers. Expertise connects people with the best local experts. They scored landscapers in Chicago on more than 25 variables across five categories, and analyzed the results. Then gave a hand-picked list of the best landscapers. 1. Reputation: A history of delighted customers and outstanding services. 2. Credibility: Building customer confidence with licensing, accreditations and awards. 4. Availability: Consistently approachable and responsive so customers never feel ignored. 5. Professionalism: Providing services with honesty, reliability and respect. We are honored to be in the Top 23 out of 690 landscapers. I would like to thank God for this award and the opportunity to serve in our communities. I would also like to thank Angelo at “AGC Global Marketing” for years of website support and Internet marketing consulting. If you need help with your online presence please give him a call at (331) 251-8053. ← Note from one of our Customers!